Closing out the first third of their season, the Colorado Avalanche are off to an impressive start considering what has occurred over the last few years. Currently third in the Central division, the Avs are 20-9-0 and have maintained their position amongst their peers while staying focused on playing solid hockey. They don’t win every game, but they have been dependable thus far to not lose game after game like in recent seasons. Last season the Avs were pretty much winning one of every five games. The season before that the Avs could barely win a game and a winning streak was a foreign concept that existed outside of the organization. Gabriel Landeskog had a down lockout shortened season, scoring only 17 points after his 52 point Calder Trophy winning season. He’s back, leading the team now with 22 points, just one point ahead of Matt Duchene who is having a resurgent season and leading the team in goals scored (12). P.A. Parenteau has been an anchor for the team, holding it down on the ice and being the most worthwhile trade that the Avs have made in recent memory. Parenteau has put up 18 points in the first third and had 43 in the lockout shortened season earlier this year. The Avs have just looked, acted and played better than they did under former coach Joe Sacco. Patrick Roy returning to the organization and his pairing with Joe Sakic to steer the ship back towards respectability has so far proven to be very successful. The biggest hurdles for Colorado are remaining consistent while still improving, injuries and the ongoing case against Semyon Varlamov. JS Giguere has been quite capable in net, but how prepared are the Avs to go forward with only Giguere as their starting goalie? Gabriel Landeskog has plenty to celebrate this season. His Avalanche are third in the division and only six points out of first place. 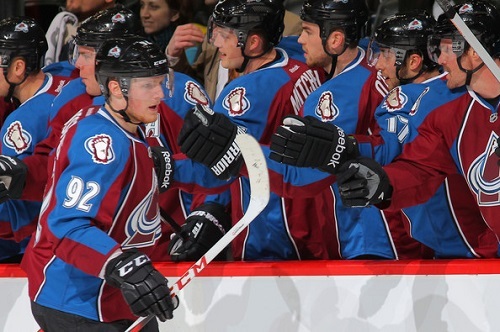 The Avs this season have come to play and have proven they can hang in the Western Conference. Now they must gain some ground on teams like St. Louis who lead the Avs by three points and in head-to-head. Let’s not also forget that the defending champs are leading the entire conference with 49 points. The Avs have their work cut out for them and an uphill battle that they –luckily- are better suited for than they were a year ago.